Authenticity appeals. It draws instinctual attraction and builds trust. The body language of an authentic person stands out and communicates louder than words. When thoughts and words are in tune (when a person believes what they are saying) you see it corroborated in their body language. When gestures and expressions are in alignment with what is being said, one radiates authenticity, and as a result, trust grows. Trust is essential in any form of social relationship or business transaction for its sustenance and longevity. It helps people to be more open. Trust is essential for faster decision making and agility. Most importantly trust makes it easier to acknowledge and accept failures without engaging in the waste of blame games. Trust works as an effective damage-control people strategy. Imagine an organization where large groups of people are trying to fulfill a common vision. And while doing so, there is a sense of community where they can flourish as human beings, easily able to express their interests and hobbies. Zappos is a great example for delivering happiness. It roots from Zappos CEO, Tony Hsieh, who is famous for believing that we “function best when we can be ourselves”. He has become a well-known leader who encourages his people just to be themselves. And that’s an essential element when wanting to foster a social environment of authenticity, trust and happiness. He is a real-time example of authentic leadership who has given the management consulting industry a great example of Holacracy and Self-Organization model. Following is a list of Zappos values. 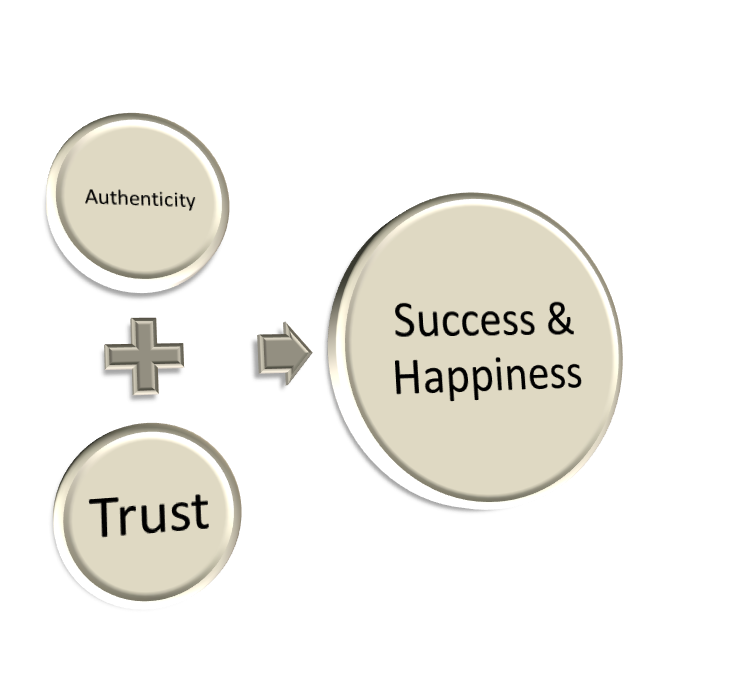 HOW TO EMBED AUTHENTICITY, TRUST, HAPPINESS IN CULTURE? Acknowledge the unfulfilling and undesired to develop a collective spirit driving urgency for change. Scenarios based storytelling works great to generate compassionate perspective and address the unconscious bias. I have personally facilitated Mindfulness based self-reflective leadership workshops as a supportive method. It helps foster authenticity, trust, relatedness, realism, compassion and readiness of collaboration. Improv! Great way to break barriers, foster team happiness & showcase how self-organizing, agile, trust-based teams co-create. A well-designed theatrical act (or Improv sessions), can be a great way to foster desired values and principles. I have personally hired Improv facilitators, to help with this kind of fun effort. Highly rewarding! Setup co-creative spaces & launch change adoption campaigns. I find co-learning, co-operative, socially connected spaces create a strong serendipitous self-organizing community rhythm. Reward, repeat and reinforce the desired behavior. until it becomes part of the culture. – reward and celebrate, especially those who demonstrate the desired value system. Setting up “Rewards Booth” in co-op spaces where human social reward circuits are highly active. Good read. Although it would be nice to see some neuroscience based proven methodologies to build trust within social organizations.